Our In-Shop capabilities are extensive! 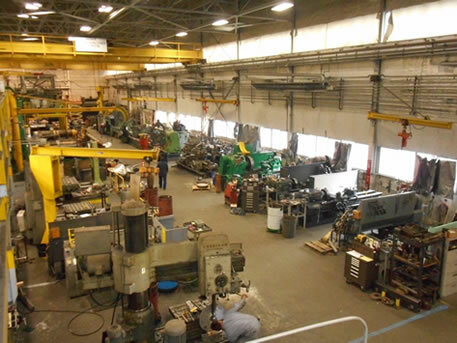 Everett Engineering, Inc. is located on almost five acres on the Everett, WA waterfront and has close to 80,000 square feet of building space. 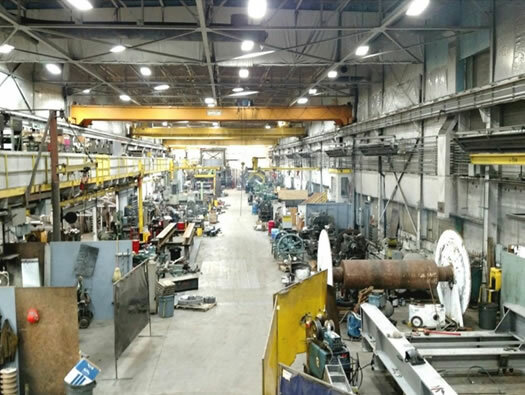 Our machine and fabrication shop is over 27,000 square feet including the mezzanine, mill room and mechanics shop. This building houses our manual lathes, mills, and welding equipment. 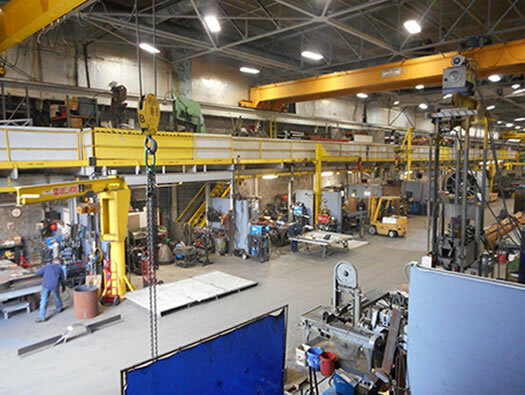 We have 4 overhead bridge cranes from 5 Ton to 20 Ton that span the shop. 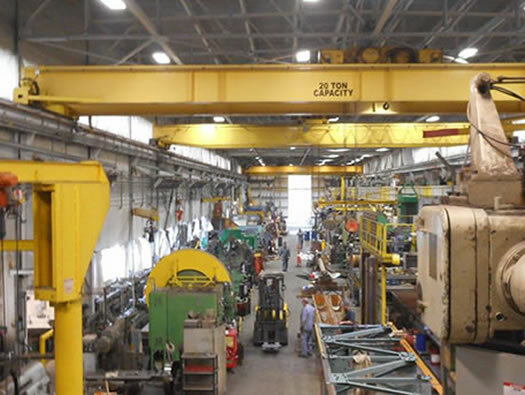 We have additional jib boom cranes to assist with smaller lifting jobs. 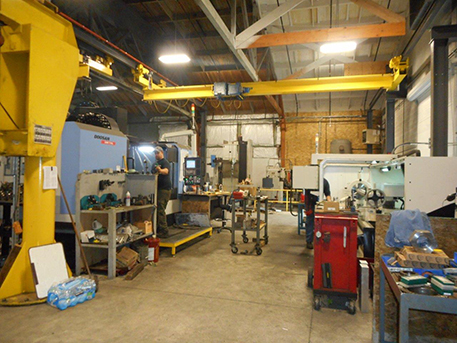 Our CNC room contains the majority of our CNC mills and lathes, as well as large diameter gear cutting capacity. Our warehouse space contains our stock material, a CNC gantry mill, field equipment and tooling, material cutting stations and floor space for assembling large fabrications. 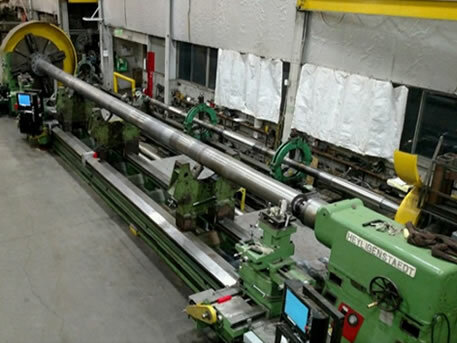 EEI's lathes on the main shop floor range in size from a small Monarch tooling lathe with a 6" chuck and bed length of less than 30" up to and including our large Heyligenstaedt lathe, pictured above in the foreground, with a 72" chuck and bed length of 55 feet. After we purchased this machine we converted it to CNC controls on both carriages. 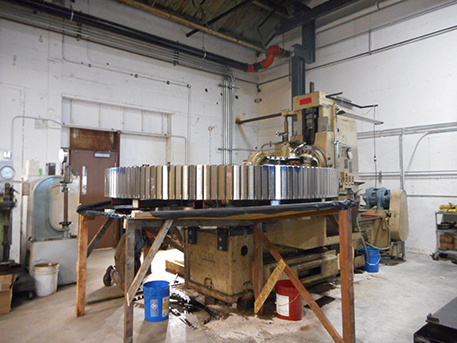 We have over 20 mills operating on our shop floor, they range from smaller knee mills, threading mills, and gear hobbing machines to large capacity horizontal and vertical mills. There are four horizontal mills on the main floor of different sizes and configurations for different types of jobs. The largest has a combined linear travel close to 18 feet. 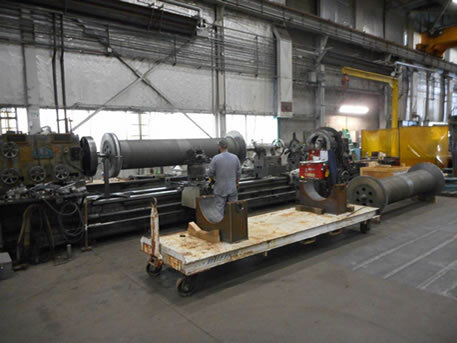 Our open side planer mill has a 7 foot wide x 20' long bed. 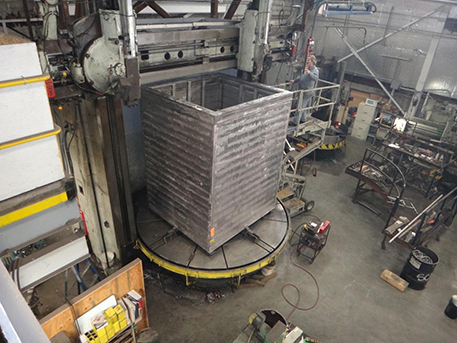 With three vertical boring mills we are able to machine a wide range of parts including the 9 foot tall box pictured below, this particular machine has a swing of 12 feet in diameter. Our smaller machine has a table of 42 inches. 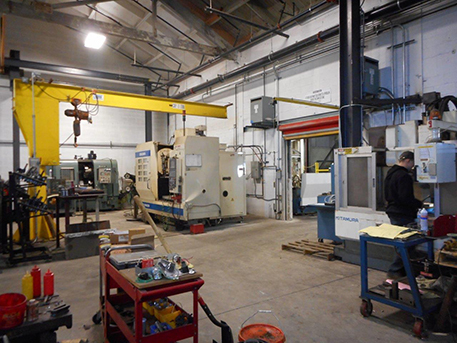 The CNC room contains 7 of our CNC mills and lathes. We have three vertical machining centers of different sizes, two of which are 4th axis capable and one of those has the rotary table. 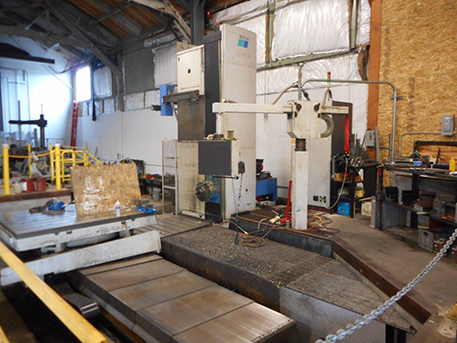 Our horizontal machining center has a 4th axis and a machining envelope of 137 1/2" X 97". 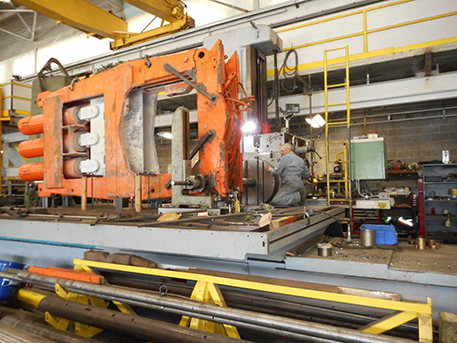 We have two slant bed style turning centers and a flatbed turning center with live tooling, our larger capacity machine has a 30" chuck and a bed travel of 120". 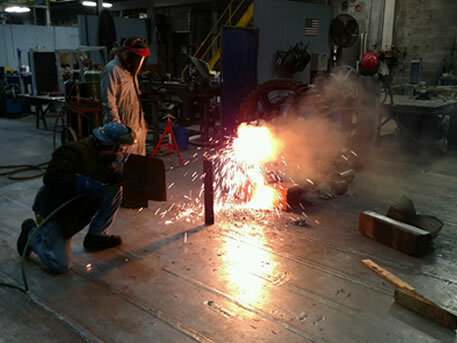 We have welders on staff that are ASME, AWS, & ABS certified. We are also ABS certified to perform the repair or cladding of propulsion shafting, props and rudders (Grades 2, 4C, 316L, Aquamet 19 & 22). 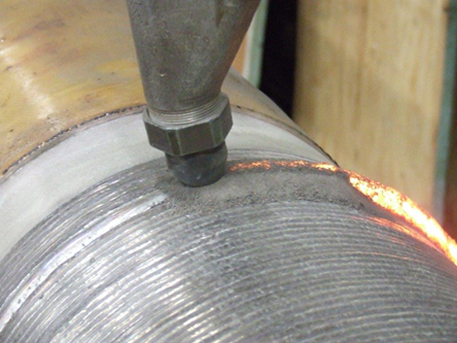 Our SubArc welding machine can handle shafts up to 36" diameter x 50' long. 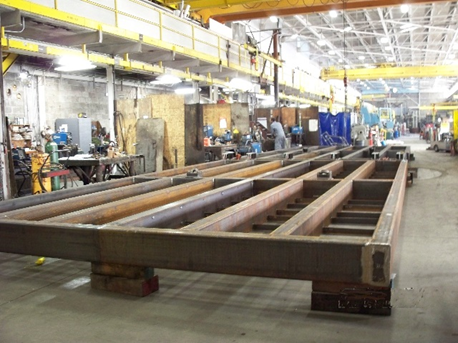 Our large layout table and warehouse/floor space can accommodate large structural fabrications and assembly.